Documented from the Scrolls of the Reign of Anna Leigh, Queen of Æthelmearc: the Business of The Feast of the Seven Deadly Sins, February 9th, Anno Societatis LIII, in the Barony of Delftwood. As recorded by Maestro Orlando di Bene del Vinta, Jewel of Æthelmearc Herald, with assistance from Lord Salvadore de la Torres. Her Majesty gave leave to Their Excellencies to hold their final baronial court. Her Majesty then called for Marcus and Desiderata, Baron and Baroness of Delftwood, and upon thanking them for their years of service to Delftwood did divest them of their baronial coronets. Her Majesty then called for THL Amalie Reinhardt and Lord Ixac Ben Simone, and after hearing words from the seneschal of Delftwood that a proper election had occurred and that it was the will of the populace that Amalie and Ixac serve as the next Baroness and Baron of Delftwood, did receive the oath of fealty from Amalie and Ixac and did invest them as the 12th baroness and baron of Delftwood. Her Majesty then gave leave to the Amalie and Ixac to hold their court. 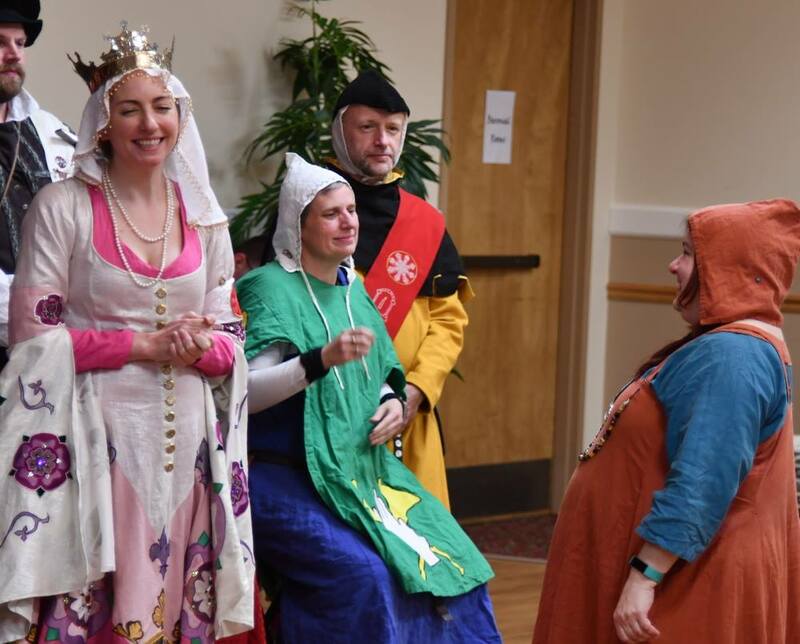 Following baronial court, Her Majesty called for Dame Desiderata Drake and THL Marcus Claudius Cincinnatus. Again acknowledging and thanking them for their years of service to Delftwood did present each of them with a cornet and named them as a baroness and baron of the court. Scroll for Desiderata by Helene von Mutzenhausen, scroll for Marcus by Shirin al-Sussiyya. 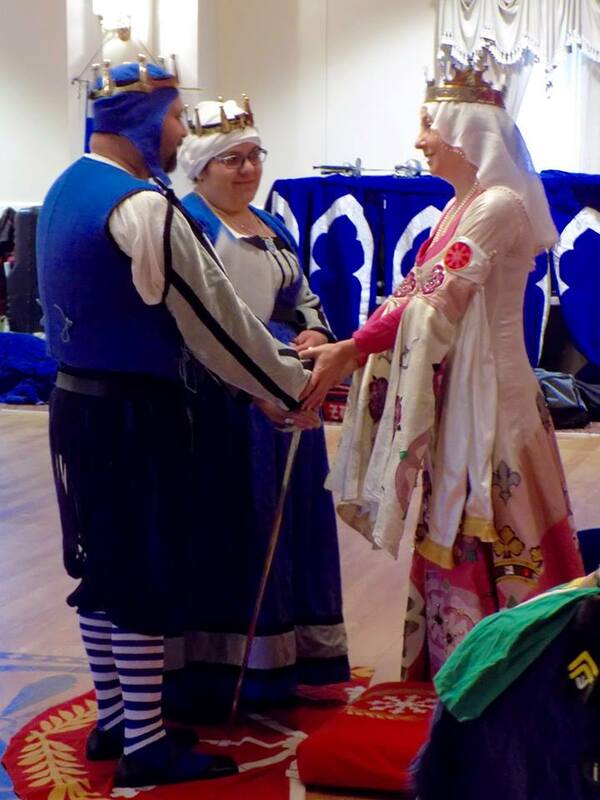 Her Majesty then called for Harpalea of Delftwood and Archiao of Delftwood and presented them with their AOA scrolls that were previously awarded by Her predecessors. 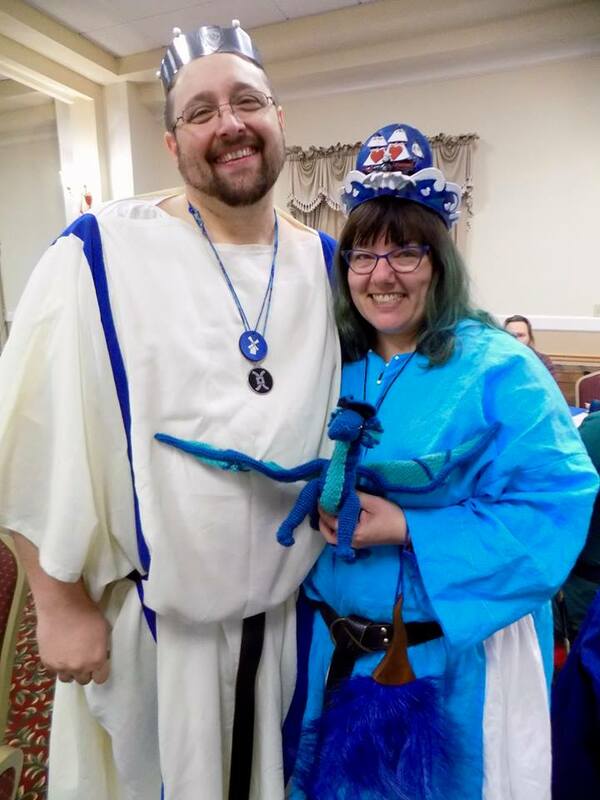 Next, Her Majesty received THL Elyse le Bref along with the Order of the Pelican and did send Elyse off to vigil to contemplate elevation to the Order of the Pelican. Her Majesty gave leave to the Baroness and Baron of Delftwood to hold their court. Her Majesty then received all children and sent them off to select an item from the toy chest. She then received all newcomers for whom this was their first event or first court, and did present them each with a gift. Next Lady Gina Dragoni was called before the throne and was created a Baroness of the Court for her support of Her Majesty and for the endless amount of largess she has provided. Scroll by Gulsah al-Zakiyya. Baron Ixac Ben Simone was then granted arms by Her Majesty for his new role as Baron of Delftwood. Her Majesty then saw Lord Jasper Longshanks and Lady Felice de Thornton and received gifts of largess by their hands. Wishing to thank them for all they have done in providing largess throughout Her Majesty’s reign did create them a baron and baroness of the court. Her Majesty then called for Kettlingr and did award her arms for her years of service and participation in the Society. Scroll by Ekaterina Volkova. Next, Her Majesty called for Moniczka Poznanska and acknowledging her skills in the fiber arts, embroidery, and her contributions to largess, did create her a companion of the Fleur d’Ӕthelmearc. Scroll by Lady Umm Samin bint Asad al-Isfahaniyya. Miruska Lyubomy was then awarded arms for her skill in archery and thrown weapons. Scroll by Aurelia Argenta Prima. Harikr, of the Shire of Blackwater, was next awarded arms. Scroll by Duchess Liadain ni Dheirdre Chaomhinaigh and Mistress Jenna MacPherson. Draco Wolfheart was then called before Her Majesty and presented with a Golden Escarbuncle. Mor, of the Shire of Blackwater, was then awarded arms. Scroll by Scroll by Duchess Liadain ni Dheirdre Chaomhinaigh and Mistress Jenna MacPherson. Her Majesty then called for THL Minamoto Kumamoto Sakurako and did induct her into the Order of the Keystone for her service to her barony and for her contributions of scrolls and other gifts to the kingdom. Scroll by Rhys Penbras ap Dafydd. 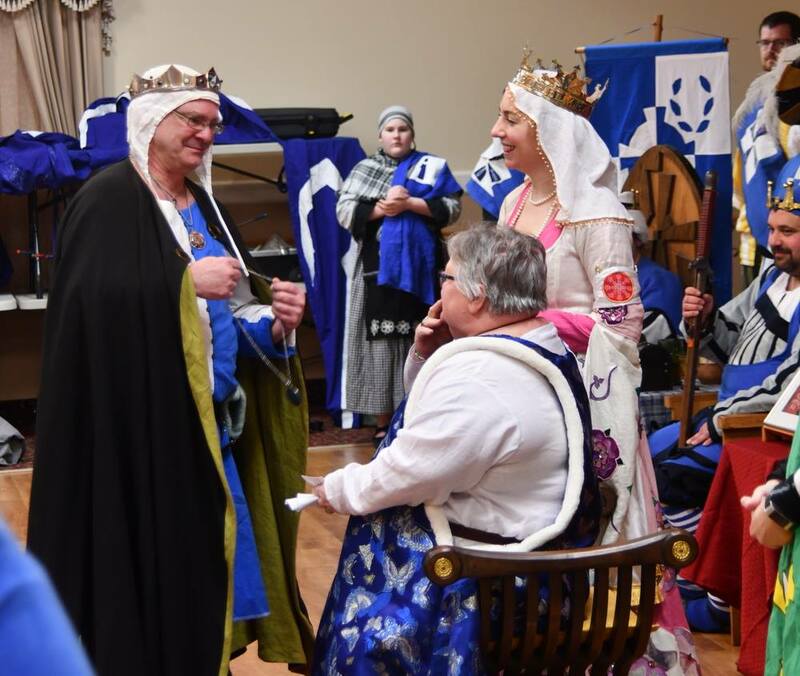 Lady Glenna Cholmondeley of Delftwood was next inducted into the Order of the Sycamore for her teaching and her skill with sprang and spinning. Scroll by Eleanor of Godwin. 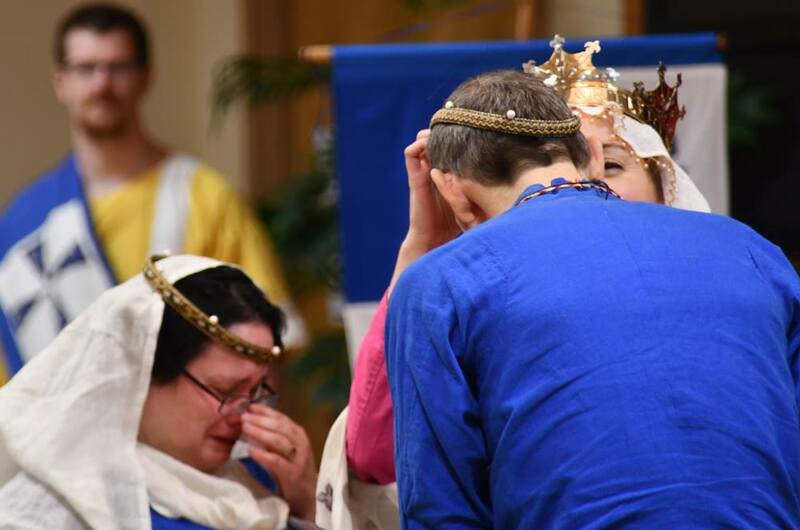 Ilaria of Delftwood was then summoned by Her Majesty and inducted into the Order of the Sycamore for her creation of period garb and accessories. Scroll by Sebastienne la Rousse. Her Majesty then called for Lord Robert Ferness and for his skill in the creation of period shoe-making did induct him into the Order of the Fleur d’Ӕthelmearc. Scroll by Caleb Reynolds. THL Elyse le Bref next appeared before the throne, having sat vigil that day contemplating elevation to the Order of the Pelican. Answering in the affirmative that it was her desire to join the Order, Her Majesty then heard testimony of Elyse’s worthiness. Duchess Gabrielle van Nijenrode told of her first encounter with Elyse and how she continues to be impressed by her courtesy and industry and sharing her love and heart with others. Duke Timothy of Arindale told of how Elyse embodies all that is best of the Society. Mistress Antoinette de la Croix described Elyse as having the heart of a servant. 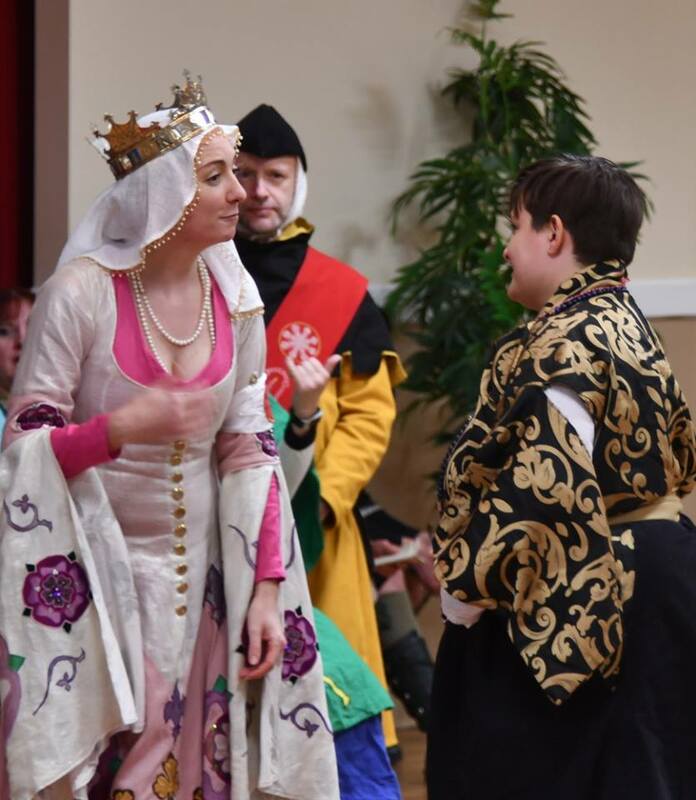 Lord Leonardo Capriolo told of how Elyse creates a realm of love and welcome for others, and Baroness Orianna Fridrikskona sent words describing the courageousness of Elyse. 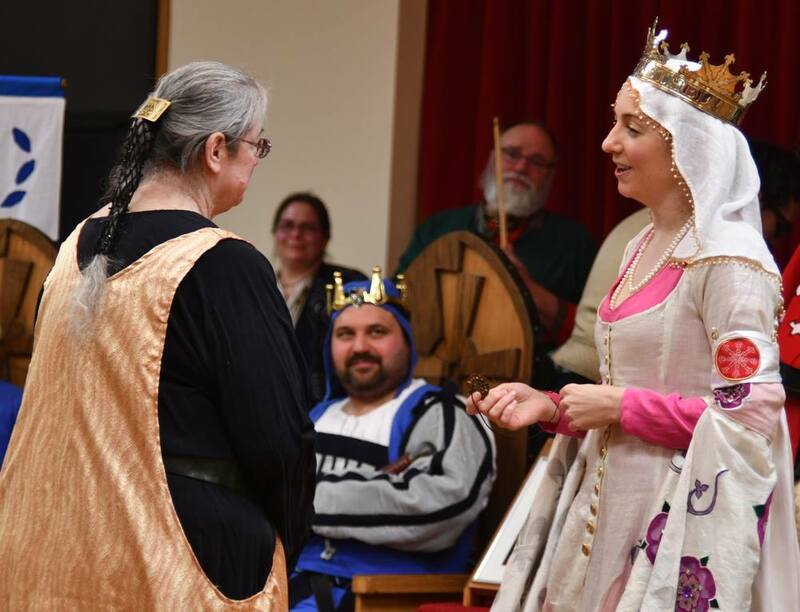 Having been satisfied by this testimony of the peers and populace of the realm, Her Majesty called for the cap, hat, and medallions to mark Elyse with her new station as a member of the Order of the Pelican and received her oath as a peer of the realm. Scroll by THL Vivienne of Yardley. Lastly, Her Majesty named Lady Marguerite de Neufchasteau as Her inspiration for the day. Being no further business, this court was then closed. Master Orlando – it was Baroness Orianna Fridrikskona who sent her words through Matilda, not Odrianna Vander Brugghe.